Five Points Bottle Shop carries just about every beer, wine or liquor you could possibly want including rare finds and local favorites. Folks drive from all around—Atlanta, South Georgia or as far away as Tennessee and the Carolinas. 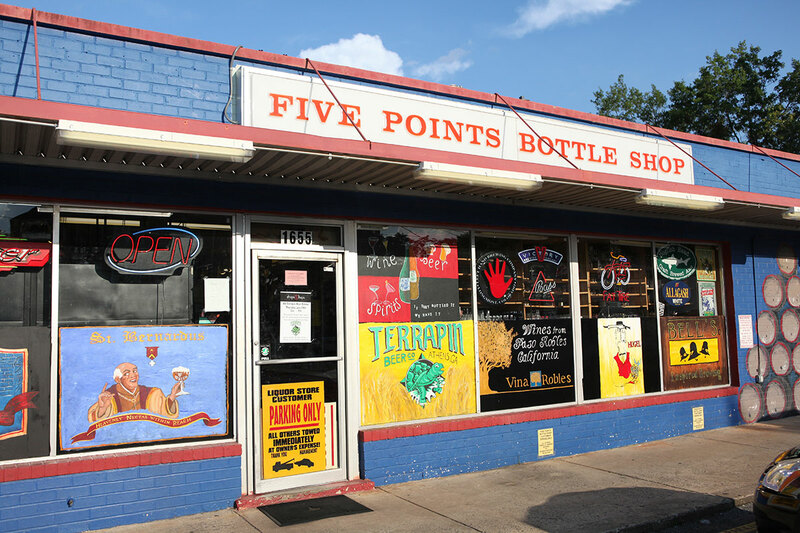 Five Points Bottle Shop, co-owned by brothers Bush and Sachin Patel, has been a landmark in the Five Points neighborhood for a quarter century now and promises to be for another, at least. The bright blue and red painted brick exterior gives the appearance of a vintage convenience store, but proves deceiving. Only the hand-painted signage along the outside of the building offers a clue to the treasures and personalized service within. Walk in and find yourself immersed in a maze of tall wooden shelving stocked to the ceiling with every kind of wine, liquor or beer that you can imagine; it’s a tight fit, but it’s worth it. Or visit our Westside location with wide isles and high ceilings. to Browse our shelves and immerse yourself in the staggering selection of favorites and rarities. Walk in to Five Points Bottle Shop and you’ll walk away with something delightful. Can’t find what you’re looking for? We are more than happy to find it for you or order it’s available. Ask our staff about a particular selection and you’ll get the inside story from start to finish. From hard-to-find to tried-and-true, every bottle we sell is picked to be savored and enjoyed. We are always tasting what’s new so that we can bring you the latest and greatest available in Georgia.